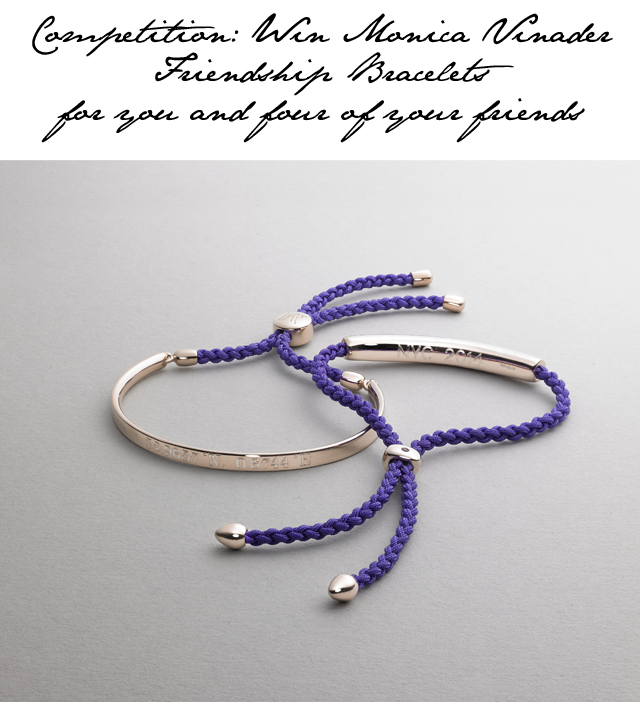 Competition: Win Monica Vinader Friendship Bracelets for you and four friends! I'm super excited to launch a competition today with a brand that is near and dear to my heart - Monica Vinader. I kid you not, it was a Monica Vinader bracelet that first started, what is today known as, my ongoing arm party. It was bright pink with a gold embellishment and it stayed on my wrist for two years straight before I took it off one night and lost it in a Parisian hotel. To say I was devastated was an understatement. Anyway, that's my Monica Vinader background, but you're not really here to read about that are you? You wanna know how you can win a piece of the brand for yourself. Well, you may remember I wrote a piece on Friendship Bracelets a few months ago. I spoke about their importance in reminding us daily of our incredible networks in life, and the wonderful experience of giving and receiving such a wonderful gesture of love. In keeping with this comeback, Monica Vinader asked me if I'd like to offer one group of friends some Friendship Bracelets of their very own. Simply Tweet us both - @MonicaVinader and @Fashionfoiegras- and share your favourite friendship bracelet from the MV website , oh and make sure you tag #FriendshipFriday! It's easy as that. Now get to it! The competition starts right now and we want to see some good entries.